Valor, courage, bravery and nobility, personality and patriotism if all are to be seen together in one place then it is Pakistan army that you need to look at. They are the ones that are the protectors of Pakistan and whole country stands beside them. Whatever the scenario may be but they are the ones who will stand for their people and always have. In the times of disturbance and uncertainty they have given their lives and their children’s lives on 16thDecember 2014 in Peshawar but still they stand steady to protect the country against all the evils. 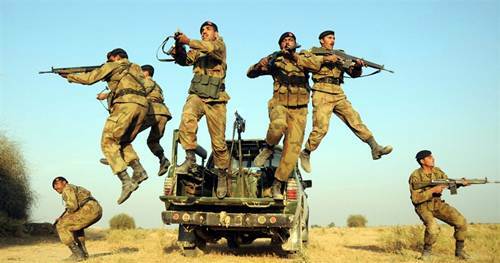 Whenever Pakistan has faced internal or external threats Pak army has stood up and protected its people. They are the reason why all Pakistanis sleep at night without any fear as they are the ones who stay awake to guard us. People of Pakistan have always wanted their children to be a part of Pakistan army as it is the noblest of all professions in his country. Pakistan army is the 7th largest military of the globe; no one can defeat our forces as their courage is incomparable to any other country’s military. Pakistan is the only country in Islamic world that has respected their woman so much that they are now major generals too. Major general Shahida Malik was the first female two-star general. Total 2.7% of GDP is spent on the Pak army. Pakistan is the country that has been formed on the name of Islam and Islam teaches that non-Muslims have equal rights as any other Muslim resident of country and this is what we see in our Pak army where many non-Muslims are ranked as brigadiers too. Nishan-e-Haider is the noblest of all awards and when our Shaheed are awarded it this is the biggest award for their parents. Pak army is the only army in world where people come to serve without fear of death. Their pride of being Army soldier is much more than any other service. Mothers always keep their sons ready to fight as Pak army personnel and without any doubt this is the wish of every Pakistani mother that she is a mother of Shaheed. Youngsters have strived to get into army and we all Pakistanis stand by our beloved army.